I’ve been looking into the way we and especially leaders use Social Media. I’m building a toolkit to help people examine and reflect on how they interact on such platforms using Twitter as the test bed. In looking at how leaders use Social Media, I’ve written before about purposeful and meaningful behaviours. I think the “just have a go” approach gets your toe dipped but doesn’t really help you be who and how you want to be, authentically. 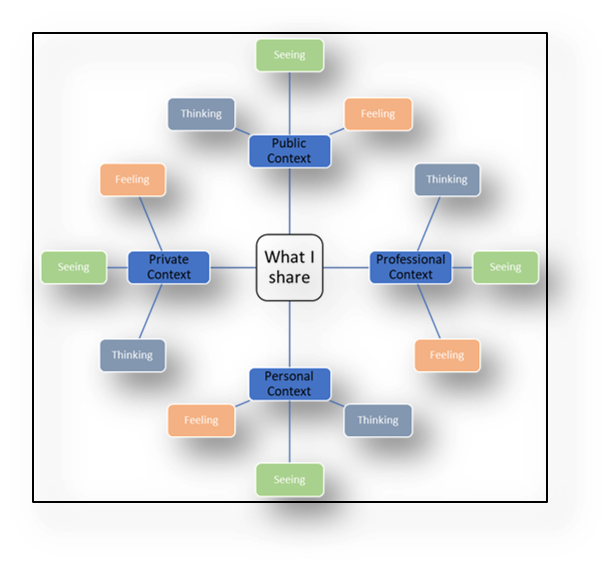 I’m currently prototyping the following model as a way of exploring engagement and usage. Not to say what is right for you but to help you think more about who and how you want to be. I want to put this out there without explanation of terms just to solicit thoughts, reactions, comments, dialogue. Working out loud (#WOL) if you like. What does the diagram provoke for you?